In contrast to Ag-specific αβ T cells, γδ T cells can kill malignantly transformed cells in a manner that does not require the recognition of tumor-specific Ags. Although such observations have contributed to the emerging view that γδ T cells provide protective innate immunosurveillance against certain malignancies, particularly those of epithelial origin, they also provide a rationale for developing novel clinical approaches to exploit the innate antitumor properties of γδ T cells for the treatment of cancer. Using TRAMP, a transgenic mouse model of prostate cancer, proof-of-concept studies were performed to first establish that γδ T cells can indeed provide protective immunosurveillance against spontaneously arising mouse prostate cancer. TRAMP mice, which predictably develop prostate adenocarcinoma, were backcrossed with γδ T cell-deficient mice (TCRδ−/− mice) yielding TRAMP × TCRδ−/− mice, a proportion of which developed more extensive disease compared with control TRAMP mice. By extension, these findings were then used as a rationale for developing an adoptive immunotherapy model for treating prostate cancer. Using TRAMP-C2 cells derived from TRAMP mice (C57BL/6 genetic background), disease was first established in otherwise healthy wild-type C57BL/6 mice. In models of localized and disseminated disease, tumor-bearing mice treated i.v. with supraphysiological numbers of syngeneic γδ T cells (C57BL/6-derived) developed measurably less disease compared with untreated mice. Disease-bearing mice treated i.v. with γδ T cells also displayed superior survival compared with untreated mice. These findings provide a biological rationale for clinical trials designed to adoptively transfer ex vivo expanded autologous γδ T cells for the treatment of prostate cancer. The view that cellular immune responses might be exploited for the treatment of cancer is not new. Interestingly, to date, the majority of studies in this regard have focused primarily upon adaptive cellular immune responses mediated primarily by tumor Ag-specific αβ CTL. However, despite major advances in the field, clinical approaches that rely upon the generation of highly specific adaptive cellular immune responses directed against tumor-associated or tumor-specific Ags have only been modestly successful. With this result in mind, particularly in the context of developing and testing new cell-based cancer therapies, it becomes important to consider and explore tumor Ag-independent (innate) cellular immune responses mediated by such cells as NK cells and γδ T cells. Unlike αβ T cells, which recognize specific peptide Ags presented by MHC molecules, γδ T cells in contrast can recognize generic Ags, which are physiologically expressed by stressed cells, including cells that have undergone malignant transformation. Indeed, cancerous cells are now known to display a number of stress-induced Ags (e.g., MICA/MICB in humans; Rae-1 in mice) that although neither tumor-specific nor tumor-derived per se, can nonetheless serve as recognition determinants for human and mouse γδ T cells (1, 2, 3, 4, 5, 6). Although a functional homology between mouse and human γδ T cells has yet to be firmly established in this specific regard, the complementary study of both mouse and human γδ T cells has yielded important insight into how γδ T cells recognize and kill malignantly transformed cells in vitro and in vivo. For example, as expertly reviewed by Girardi (5) and Kabelitz et al. (6), it is now evident that both mouse and human γδ T cells use various pairings of specific TCRγδ chains, often in combination with key coreceptors such as NKG2D, to interact with determinants commonly expressed on tumor cells that are susceptible to γδ T cell-mediated killing. Indeed, it is this ability of both mouse and human γδ T cells to recognize and kill cancer cells of various histological subtypes in a tumor Ag-independent manner that has contributed to the emerging view that γδ T cells provide protective immunosurveillance against cancer. This view is supported by the findings that mice lacking γδ T cells are more susceptible to the development of chemically induced cutaneous tumors and are likewise less able to resist challenges with tumorigenic melanoma or squamous cell carcinoma cell lines (7, 8, 9). In this report, we begin with proof-of-concept studies that both confirm and extend these important initial findings of others (7, 8, 9). In this study, we demonstrate for the first time that γδ T cells are indeed capable of providing protective immunosurveillance against a spontaneously arising noncutaneous solid tumor of epithelial origin, in this instance, mouse prostate cancer. For these studies, transgenic mice that spontaneously develop prostate cancer were bred with γδ T cell-deficient mice, which allowed for observation of tumor development occurring in the absence of γδ T cells. Findings from these initial proof-of-concept studies were then used as the rationale for performing subsequent studies to conversely examine how the adoptive transfer of supraphysiological numbers of syngeneic γδ T cells might be used to treat tumors established in otherwise healthy mice. The model of transgenic adenocarcinoma of the mouse prostate (TRAMP) was chosen for these studies because it is a model of spontaneously arising mouse prostate cancer that mimics human disease (10, 11, 12, 13). As disease that develops in TRAMP mice histologically resembles human disease with pathology ranging from noncancerous prostatic intraepithelial neoplasia to aggressive adenocarcinoma of the prostate (10, 11, 12, 13), the TRAMP model has been widely adopted for use in a variety of studies designed to assess novel therapies directed against prostate cancer (14, 15, 16, 17). Accordingly, we have adopted this model to first assess the extent to which the absence of γδ T cells might be permissive for the development or progression of spontaneously arising mouse prostate cancer. Extending from these studies, immunotherapy studies were then performed by first establishing disease in healthy wild-type C57BL/6 mice using TRAMP-C2 cells, a syngeneic mouse prostate cancer cell line originally derived from TRAMP mice (C57BL/6 genetic background) (18). 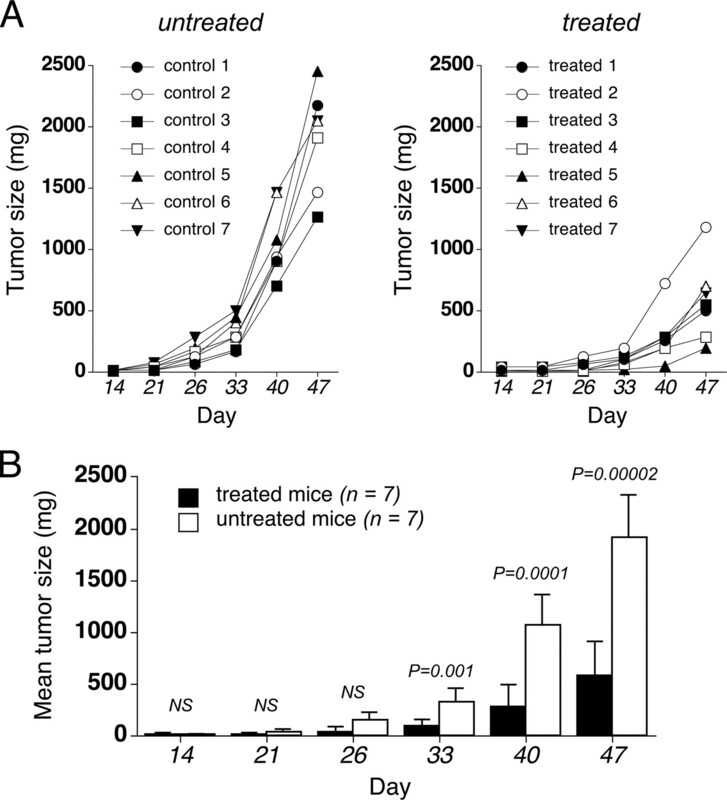 Disease-bearing mice were then treated with supraphysiological numbers of ex vivo expanded syngeneic (C57BL/6-derived) γδ T cells, thus approximating a clinical situation in which a tumor-bearing patient might be treated with supraphysiological numbers of ex vivo expanded autologous γδ T cells. Given the recognized capacity of γδ T cells to innately kill malignant cells, efforts are now actively underway to develop the means to exploit the antitumor properties of γδ T cells for clinical purposes (6, 19). Although it remains to be determined specifically how this exploitation might best be accomplished, two general approaches are currently being taken in this regard. One approach includes strategies primarily designed to activate or expand endogenous γδ T cells in vivo, for example through the clinical administration of pharmacological agents such as the aminobisphosphonates pamidronate (Aredia) or zoledronate (Zometa). Though commonly used to prevent skeletal fractures in cancer patients, these drugs have recently been found to cause the in vivo activation or expansion of human γδ T cells, particularly when administered in conjunction with IL-2 (20, 21). Importantly, recently published results from a phase I clinical trial strongly support the view that such activated γδ T cells found in zoledronate-treated patients contribute either directly or indirectly to the clinical responses observed in patients with hormone-refractory prostate cancer (22). Alternatively, the innate antitumor properties of human γδ T cells might also be exploited through the adoptive transfer of γδ T cells first expanded ex vivo, then subsequently reinfused into tumor-bearing patients. Though such approaches are far less well developed given the difficulty in generating a sufficient number of γδ T cells, recent advances by our group and other researchers have now made possible the efficient large-scale ex vivo expansion of human γδ T cells that importantly retain potent innate antitumor activity against a variety of human cancer cell lines in vitro (23, 24, 25, 26, 27). Thus, irrespective of the methods used for the ex vivo expansion or activation of γδ T cells, it is now feasible to propose clinical trials designed explicitly to assess the therapeutic effectiveness of administering a large number of γδ T cells to patients with cancer. With this reasoning in mind, our specific findings derived using the TRAMP model of mouse prostate cancer are presented in this study to be considered in the broader context of developing new strategies for treating human prostate cancer, or other common human cancers of epithelial origin, through the adoptive transfer of ex vivo expanded autologous γδ T cells. C57BL/6 wild-type mice; C57BL/6 TRAMP mice (C57BL/6-Tg(TRAMP) 8247Ng/J); C57BL/6 TCRδ-deficient (TCRδ−/−) mice (B6.129P2-Tcrdtm1Mom/J); C57BL/6 TCRβ-deficient (TCRβ−/−) mice (B6.129P2-Tcrbtm1Mom/J); and C57BL/6 GFP mice (C57BL/6-Tg(UBC-GFP)30Scha/J) were purchased from The Jackson Laboratory. All mice were maintained in pathogen-free facilities in accordance with guidelines of the Animal Care and Use Committee at The University of Alabama at Birmingham (Birmingham, AL). To obtain TRAMP mice on a TCRδ−/− background, TRAMP mice and TCRδ−/− mice were first interbred. Tail DNA isolated by standard procedures was used for genotyping of mice by PCR using the following specific primers: TCRδ 5′-CAA ATg TTg CTT gTC Tgg Tg-3′ and 5′-gTC AgT CgA gTg CAC AgT TT-3′; and TRAMP 5′-CAg AgC AgA ATT gTg gAg Tgg-3′ and 5′-ggA CAA ACC ACA ACT AgA ATg CAg Tg-3′. Offspring carrying the TRAMP transgene that were found to be heterozygous for TCRδ (TCRδ−/+) were then backcrossed with homozygous TCRδ−/− mice. Male offspring expressing the TRAMP transgene but lacking γδ T cells were then identified for further study. Absence of γδ T cells in male TRAMP × TCRδ−/− was further confirmed by FACS of peripheral blood. Upon sacrifice, GU tracts were removed en bloc, weighed, then fixed in formalin. Digital photographs of gross specimens were taken using a Nikon CoolPix 5700 digital camera. Formalin-fixed specimens were subsequently embedded in paraffin and stained with H&E as previously described (16). Prostate lesions were then scored blindly by an experienced pathologist using a 1–6 scale established for TRAMP mice (16). TRAMP-C2 cells were provided by Dr. N. Greenberg (Fred Hutchinson Cancer Research Center, Seattle, WA) and were also purchased from American Type Culture Collection. Cells were maintained as described (18). γδ T cells used for adoptive transfer studies were obtained from spleen cells derived from C57BL/6 mice lacking αβ T cells (TCRβ−/− mice) as described (28). Spleen mononuclear cells were isolated by density gradient centrifugation (800 × g, 15 min) using Ficoll-Paque Plus (Amersham Biosciences). Cells were cultured in a manner similar to methods developed for expanding human γδ T cells (23), but using mouse cytokines and reagents as indicated. Spleen cell cultures were initiated at a density of 5 × 106 cells/ml in RPMI 1640 with 10% FBS, 2 mmol/L l-glutamine, 100 U/ml penicillin, 100 U/ml streptomycin, and 50 μM 2-ME. On the day of culture initiation (day 0), cells were transferred to tissue culture wells first coated with rat anti-mouse CD2 mAb clone RM2-5 (BD Biosciences). Recombinant mouse IFN-γ (1000 U/ml; R&D Systems) and recombinant mouse IL-12 (10 U/ml; R&D Systems) were then added. After 24 h (day 1), three volumes of fresh culture medium was added. Cultures were then stimulated with 10 ng/ml anti-CD3 mAb clone 145-2C11 (BD Biosciences) and 300 U/ml mouse recombinant IL-2 (R&D Systems). Fresh medium with 10 U/ml human IL-2 (Roche Diagnostics) was added every 3 days. At day 8, cells were harvested. Purity of γδ T cells was assessed using a FACSCalibur flow cytometer (BD Biosciences) employing directly conjugated hamster anti-mouse Abs CD3-allophycocyanin, 145-2C11, TCRγδ-FITC, or GL3 (all BD Biosciences). Cell viability was determined by FACS or by fluorescent microscopy as described (23). γδ T cells derived from C57BL/6 mice lacking αβ T cells (TCRβ−/− mice) as well as control αβ T cells (derived from TCRδ−/− mice) were prepared identically, as described. These cells were then used as effector cells against 51Cr-labeled mouse TRAMP-C2 target cells in standard 4-h in vitro 51Cr release cytotoxicity assays, as described (23). As previously described (24), the calcium dependency of γδ T cell-mediated cytotoxicity was assessed by adding EGTA and MgCl2 to cell cocultures at 1 and 1.5 mM, respectively. To restore killing, 3 mM CaCl2 was added in culture with EGTA. Mice lacking αβ T cells (TCRβ−/− mice) and mice transgenic for GFP were first interbred. After backcrossing, offspring expressing GFP but lacking αβ T cells were identified by FACS analysis of peripheral blood. Spleen mononuclear cell preparations derived from these mice were then cultured as described, yielding GFP+ γδ T cells that were used for subsequent adoptive transfer studies. FACS analysis and fluorescence microscopy were used to confirm that resulting cultured cells were GFP+ γδ T cells. TRAMP-C2 cells were used to establish tumors in healthy syngeneic C57BL/6 male mice. On experimental day 0, tumor cells (3 × 106 cells suspended in 200 μl of DMEM) were injected s.c. into a flank of each mouse. On experimental days 14, 19, 21, 26, and 28, ex vivo expanded syngeneic (C57BL/6) γδ T cells (20 × 106 cells suspended in 400 μl of RPMI 1640) were administered i.v. by tail vein injection into tumor-bearing animals. Control animals received only RPMI 1640. As described (29), tumor measurements were converted to a calculated tumor weight (in milligrams) using the formula (width (mm2) × length (mm))/2. TRAMP-C2 cells were used to establish tumors in wild-type male C57BL/6 mice. Five weeks after tumor establishment, syngeneic GFP+ γδ T cells (100 × 106 cells suspended in 400 μl of RPMI 1640) were introduced by tail vein injection. After 8 days, mice were sacrificed. Upon sacrifice, tumors were excised then rinsed with PBS. Normal muscle tissue was excised from the opposite hind leg of the same treated animal. Whole fresh tumor specimens or whole muscle sections were examined directly using a Nikon Eclipse TE 2000-U inverted fluorescence microscope fit with a CoolSNAPES digital camera (Photometrics). Digital photos shown are at a magnification of ×100 and are presented as pseudocolor images derived using IPLab image processing software (version 3.9.2/Mac OS X; Scanalytics). Tumors were removed at necropsy from mice that had previously received i.v. GFP+ γδ T cells. Whole fresh tumors were mechanically disaggregated using a HandiChopper Plus food chopper (Black & Decker). Dead cells and debris were removed by density centrifugation (800 × g, 15 min) using Ficoll-Paque Plus. Interface cells were resuspended in Hanks’ buffer (containing 3% FBS) then incubated with Abs to mouse CD3 and TCRγδ. Using multicolor FACS, GFP+ cells were electronically gated then analyzed with respect to CD3 and TCRγδ surface staining. Peripheral blood samples taken from animals before sacrifice were treated with ACK lysis buffer before staining and analysis. Disseminated pulmonary metastatic disease was established in mice as has been described (30). On experimental day 0, TRAMP-C2 cells (6 × 105 cells suspended in 400 μl of DMEM) were introduced by tail vein injection into healthy male C57BL/6 mice. Treated mice received 20 × 106 γδ T cells (suspended in RPMI 1640) by tail vein injection on experimental days 4, 8, and 11, whereas control mice received RPMI 1640 only. Assessment of pulmonary metastases in treated and untreated mice was performed, as described (30) with the following modifications. At necropsy, lungs from each animal were removed en bloc, weighed then fixed in formalin for subsequent analysis. Photographs of gross specimens were taken using a Nikon Coolpix 5700 digital camera. Formalin-fixed lungs were sectioned sagittally (superior to inferior) then embedded in paraffin for H&E staining. Digital images of lung sections were produced using a Nikon Coolscan V ED scanner using Nikon Scan 4.0 software. Morphometric analysis of lung section photomicrographs was performed using ImageJ software (version 1.37v) from W. Rasband (National Institutes of Health, Bethesda, MD) (http://rsb.info.nih.gov/ij/). Tumor involvement of lung sections was determined by expressing the area of lung parenchyma involved with tumor (dark blue) as a percentage of total lung parenchyma. The median GU tract to body weight ratio of TRAMP mice and TRAMP × TCRδ−/− mice was compared using the Kruskal-Wallis test, whereas mean ratio was compared by t test. Pathological scores of prostate lesions occurring in TRAMP mice and TRAMP × TCRδ−/− mice were compared using Fisher’s one-sided exact test. The relationship between GU tract to body weight ratio and pathological score in TRAMP mice was examined using a one-way ANOVA. The analysis of GU tract to body weight ratio by pathological score in TRAMP × TCRδ−/− mice was examined using ANOVA with Duncan’s Multiple Range Test (tested at 5% level) used to control for pairwise comparisons. In immunotherapy studies, mean tumor size in treated and untreated mice was compared using the Student’s t test. Median lung weight of treated and untreated mice and tumor involvement of lung parenchyma in treated and untreated mice were compared using the Kruskal-Wallis test. Kaplan-Meier survival curves of treated and untreated mice were compared according to the Mantel-Haenszel log-rank test. As reported, male TRAMP mice spontaneously develop prostate adenocarcinomas in a predictable manner with disease developing in 100% of male mice with a relatively short latency period (10, 11, 12, 13). Accordingly, these mice were used in initial proof-of-concept studies designed to establish the extent to which mouse γδ T cells are involved in providing protective immunosurveillance against spontaneously arising mouse prostate cancer. To accomplish this study, TRAMP mice were backcrossed with mice lacking γδ T cells. Images of the GU tracts obtained from mice sacrificed during performance of one of our earliest pilot studies are shown in Fig. 1⇓A. The GU tracts of a male wild-type mouse, a TRAMP mouse, and a TRAMP × TCRδ−/− mouse are grossly compared. Given that these initial pilot studies were performed using only a small number of mice, subsequent more extensive studies were then performed to follow up and confirm these highly suggestive findings. Results from these larger studies are shown in Fig. 1⇓B. In this experiment, in accordance with convention, assessment of tumor burden in each mouse is presented graphically as the GU tract weight normalized to body weight (i.e., GU tract weight to body weight ratio). In comparing tumor burdens of TRAMP mice vs TRAMP × TCRδ−/− mice, the mean tumor burden (6.8 vs 10.5, respectively; p = 0.06, strong trend) as well as median tumor burden (7.0 vs 7.6, respectively; p = 0.11) were found to differ, though these differences did not reach statistical significance. Nevertheless, descriptive comparison of these data importantly reveals that only TRAMP × TCRδ−/− mice developed very large tumor burdens, arbitrarily defined as a tumor burden at least double the median tumor burden of the group. Thus, whereas four TRAMP × TCRδ−/− mice developed large tumor burdens (2-, 3.4-, 3.7-, and 5-fold greater than the median tumor burden of all TRAMP × TCRδ−/− mice), in contrast no TRAMP mice developed correspondingly large tumor burdens. Indeed, the largest tumor burden observed in any TRAMP mouse measured only 1.5-fold greater than the median tumor burden of the TRAMP mice group. In addition to the normalized GU tract weight to body weight ratio shown in Fig. 1⇓B, tumor burdens are also presented in this experiment as actual GU tract weights (mean ± SD) of all groups of mice: BL/6 wild-type mice (1.1 ± 0.3 g); BL/6 TCRδ−/− mice (0.9 ± 0.2 g); TRAMP mice (2.3 ± 0.7 g); and TRAMP × TCRδ−/− mice (3.9 ± 3.7 g). In comparing GU tract weights of TRAMP mice and TRAMP × TCRδ−/− mice, the value of p = 0.06 is indicating a strong trend. Importantly, at the time of sacrifice, no significant differences were observed in whole body weights when comparing control TRAMP mice (mean body weight, 36 ± 5 g) and experimental TRAMP × TCRδ−/− mice (mean body weight, 36 ± 4 g). This latter point indicates that differences in the normalized GU tract weight to body weight ratio shown in Fig. 1⇓B are reflections of differences in tumor burden (GU tract weight) and not simply reflections of variations in whole body weight between mice. Gross comparison of the GU tracts of wild-type mice, TRAMP mice, and TRAMP mice lacking γδ T cells (TRAMP × TCRδ−/− mice). A, GU tracts from male mice were removed at necropsy and photographed. A representative initial experiment shows the en bloc resected GU tracts (bladder, seminal vesicles, epididymis, prostate, and testes, excluding the kidney and ureter) removed from a 7-mo-old wild-type mouse (BL/6 wild-type) (left), a 7-mo-old TRAMP mouse (center), and a 5-mo-old TRAMP × TCRδ−/− mouse (TRAMP δ−/−) (right). B, As a measure of tumor burden, GU tract weight was determined at necropsy and expressed as a percentage of total body weight for each mouse. Data are shown for control wild-type mice (BL/6 wild type) (n = 12), control TCRδ−/− mice on the C57BL/6 background (BL/6 δ−/−) (n = 11), TRAMP mice (n = 20), and TRAMP × TCRδ−/− mice (TRAMP δ−/−) (n = 22) with the mean ± SD and median (with range) for each genotype shown. Animals in this representative experiment were pooled from cohorts of mice sacrificed at 6.5 or 7 mo of age. In accordance with our Institutional Animal Care and Use Committee guidelines, animals were sacrificed when grossly massive tumors began to become evident. Thus, to allow for meaningful comparison between experimental and control animals within a cohort, all mice within a given cohort were sacrificed when it became necessary to sacrifice any mouse within the same cohort. Importantly, mice that developed large bulky tumors requiring euthanization of a cohort were invariably TRAMP × TCRδ−/− mice and never TRAMP mice. Histological sections of the GU tracts resected from TRAMP mice and TRAMP × TCRδ−/− mice were analyzed and scored using an established grading system (16). As shown in Fig. 2⇓A, whereas 5 of 22 TRAMP × TCRδ−/− mice (23%) developed high-grade disease (adenocarcinoma, grade 6), in comparison, only 1 of 20 TRAMP mice (5%) developed high-grade disease. 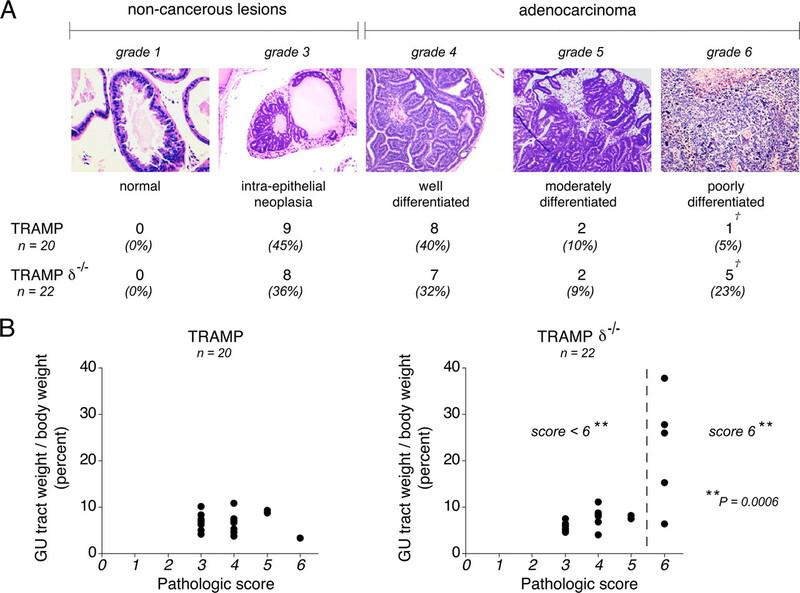 Revealingly, by plotting tumor size (GU tract weight to body weight ratio) against the corresponding tumor grade (pathological score) for each individual mouse, TRAMP × TCRδ−/− mice (Fig. 2⇓B, right) appear not only more likely to develop high-grade (grade 6) tumors, but that when high-grade tumors do develop, tumor growth is less well contained (larger tumor burden). In contrast, TRAMP mice (Fig. 2⇓B, left) appear not only less likely to develop high-grade tumors, but that when high-grade tumors do develop, tumor growth is relatively contained (smaller tumor burden). For these studies, a score of 6 was used as the cutoff for statistical analysis based upon accepted conventions in the TRAMP model literature in which this score is the highest grade lesion developing in TRAMP mice. In numerous chemoprevention studies, the ability of compounds to inhibit prostate cancer progression is assessed by the capacity of such compounds to retard the development lesions of score 6 in TRAMP mice. Accordingly, for these current studies, we reasoned that if an experimental condition (in this case, the absence of γδ T cells) is statistically shown to enhance the development of large, high-grade (score 6) tumors, then we would be justified in concluding that γδ T cells play a role in inhibiting either the development or progression of prostate cancer in TRAMP mice. Collectively, we thus interpret the data from Figs. 1⇑ and 2⇓ to indicate that γδ T cells do indeed play a role in providing protective immunosurveillance against spontaneously arising mouse prostate cancer. Tumors developing in TRAMP × TCRδ−/− mice are more likely to be high-grade and larger when compared with tumors developing in TRAMP mice. A, After weighing, GU tracts were fixed in formalin then embedded in paraffin. Sections of prostate glands were cut from paraffin blocks and stained with H&E for examination by microscopy. Prostate lesions were scored blindly by an experienced pathologist using a 1–6 scale that has been established for TRAMP mice. Noncancerous lesions were graded as 1 (normal tissue); 2 (low prostatic intraepithelial neoplasia); or 3 (high prostatic intraepithelial neoplasia). Cancerous lesions (adenocarcinomas) were graded as 4 (well-differentiated); 5 (moderately differentiated); or 6 (poorly differentiated). Representative photomicrographs are shown at the same magnification. No animal in either group was scored grade 2. The number (and percentage) of TRAMP mice and TRAMP × TCRδ−/− mice with the corresponding grade is shown. †, p = 0.057 (suggesting a trend) by Fisher’s one-sided exact test comparing the number of TRAMP and TRAMP × TCRδ−/− mice with grade 6 scores. B, GU tract weight to body weight ratio plotted against the corresponding pathological score for each TRAMP mouse and each TRAMP × TCRδ−/− mouse. In TRAMP mice (left), the GU tract weight to body weight ratio shows no relationship to pathological score by one-way ANOVA (p = 0.15). In TRAMP × TCRδ−/− mice (right), the GU tract weight to body weight ratio in animals with a grade 6 pathological score is significantly greater than the GU tract weight to body weight ratio of mice with less than grade 6 pathological scores (p = 0.0006 by ANOVA with Duncan’s Multiple Range Test comparing all pairwise differences, at 5% level). With the described proof-of-concept findings in mind, we conversely designed the following series of experiments to determine whether the adoptive transfer of supraphysiological numbers of γδ T cells might result in enhanced innate antitumor immune responses directed against established disease in tumor-bearing mice (adoptive cellular immunotherapy model). For these studies, disease was first established by the s.c. injection of TRAMP-C2 cells into the flanks of otherwise healthy wild-type male C57BL/6 mice, as previously described (18). Tumor-bearing mice were then treated i.v. with highly purified (Fig. 3⇓A) syngeneic (C57BL/6 origin) γδ T cells that were shown to be cytolytic in vitro against TRAMP-C2 cells (Fig. 3⇓B). In addition, Fig. 3⇓C shows that the lysis of TRAMP-C2 cells by purified ex vivo expanded γδ T cells is calcium-dependent, indicating that the perforin-granzyme pathway and not the Fas-Fas ligand pathway is primarily involved. In vitro cytolytic activity of expanded spleen-derived γδ T cells demonstrated against TRAMP-C2 cells. A, γδ T cells used for adoptive transfer studies were obtained by in vitro expansion of spleen cells derived from C57BL/6 mice lacking αβ T cells (TCRβ−/− mice) using a modified version of a previously published method (28 ). FACS analysis performed on cultures after 1 wk shows that >95% of viable cells in these cultures are γδ T cells. B, γδ T cells used for adoptive transfer studies were routinely found to be cytolytic in vitro against TRAMP-C2 cells, whereas control αβ T cells expanded in an identical manner were not. TRAMP-C2 cells were labeled with 51Cr then cocultured in vitro with effector γδ T cells (•) or control αβ T cells (○) at the indicated E:T ratios. The percentage of specific target cell lysis as mean ± SD of triplicate determinations is shown in a representative in vitro cytotoxicity assay. C, The in vitro lysis of TRAMP-C2 cells by highly purified ex vivo expanded γδ T cells is calcium-dependent, indicating that the perforin-granzyme pathway and not the Fas-Fas ligand pathway is primarily involved. 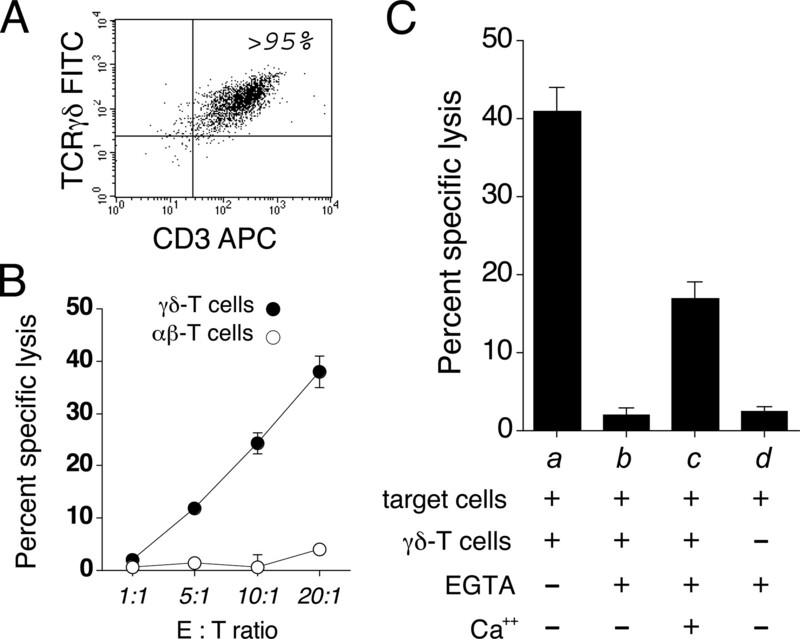 51Cr-labeled TRAMP-C2 cells were cocultured with effector γδ T cells in the presence (+) or absence (−) of EGTA. Specific lysis of TRAMP-C2 cells occurring when cocultured with effector γδ T cells under standard control conditions (a); when cocultured with effector γδ T cells under conditions in which Ca2+ is depleted by the addition of EGTA (b); and when cocultured with effector γδ T cells in the presence of EGTA but after the addition (replacement) of Ca2+ (c). Addition of EGTA has no effect on target cell 51Cr release (d). The percentage of specific target cell lysis is expressed as a mean ± SD of triplicate determinations. All E:T ratios are 10:1. A representative immunotherapy study is shown in Fig. 4⇓A in which tumor size measured serially in each individual treated and control mouse is shown. Fig. 4⇓B compares the mean tumor size of both groups. These results indicate that the growth of tumors established using mouse prostate cancer cells can be moderated by the i.v. introduction of supraphysiological numbers of ex vivo expanded syngeneic γδ T cells. Importantly, during the course of these adoptive immunotherapy studies, no untoward side effects were observed in mice receiving repeated i.v. infusions of ex vivo expanded syngeneic γδ T cells. Adoptively transferred syngeneic γδ T cells moderate the growth of established mouse prostate cancer cells in vivo. A, Serial measurement of tumor size in treated and untreated mice. TRAMP-C2 cells previously derived from tumors arising in TRAMP mice (C57BL/6 origin) were used to establish s.c. tumors in healthy syngeneic wild-type C57BL/6 mice. Fourteen days after tumorigenic cells were implanted, animals were randomly assigned to either the control group (untreated, left) or to the treatment group (treated, right). Animals in the treated group received syngeneic C57BL/6 γδ T cells (20 × 106 cells per treatment) administered i.v. by tail vein injection on experimental days 14, 19, 21, 26, and 28. Tumor size was serially determined and is shown for each individual mouse in both groups. B, Mean tumor size ± SD (in milligrams) is shown on corresponding experimental days 14, 21, 26, 33, 40, and 47 for both the treated group (n = 7) (▪) and the untreated group (n = 7) (□). Values for p were calculated using Student’s t test comparing the mean tumor size of the treated and untreated groups on the indicated days. NS, Not significant. To demonstrate that adoptively transferred γδ T cells can subsequently be detected within the tumors of host mice, the following studies were performed. As discussed, TRAMP-C2 cells were used to establish s.c. tumors in healthy male C57BL/6 mice. However in these adoptive transfer studies, syngeneic γδ T cells expressing GFP were introduced i.v. into tumor-bearing mice. Subsequently, samples of tumor, normal tissue, and blood were obtained and analyzed by fluorescence microscopy or FACS. As shown in Fig. 5⇓A, GFP+ γδ T cells are readily detectable within tumor tissues removed from treated animals, but are not readily detectable in nontumor tissues from the same animal. These findings suggest that adoptively transferred γδ T cells are preferentially localizing to tumors. FACS analysis (Fig. 5⇓B) confirms that the majority of GFP+ cells found in tumor tissue resected from treated mice are indeed γδ T cells. The i.v. administered GFP+ γδ T cells localize to established s.c. tumors as demonstrated by direct imaging and by FACS. A, TRAMP-C2 s.c. tumors were first established in wild-type C57BL/6 mice. After 35 days, 100 × 106 GFP+ γδ T cells were administered i.v. by tail vein injection into tumor-bearing mice that were subsequently sacrificed 8 days later. Immediately upon sacrifice, tumors were excised then rinsed with PBS. Freshly excised tumors were then imaged using an inverted fluorescence microscope using the appropriate filters for the visualization of GFP. Representative digital images show a tumor resected from an animal treated i.v. with GFP+ γδ T cells (left), normal muscle resected from the same animal (center), and a tumor resected from a mouse that received no GFP+ γδ T cells (right), included as a control for nonspecific autofluorescence. Images are shown at ×100 magnification. In addition (data not shown), in normal healthy mice (i.e., mice without tumors) receiving GFP+ γδ T cells, although occasional GFP+ events could be directly observed, we failed to detect by microscopy the gross accumulation of GFP+ γδ T cells within various normal tissues including muscle, skin, brain, GU tract, intestine, and lungs. Although some GFP+ γδ T cells were also evident in spleen and lymph nodes, no gross accumulations were noted in these tissues as well. B, TRAMP-C2 tumors were removed at necropsy from mice that had received GFP+ γδ T cells i.v. 8 days before. After mechanical disaggregation followed by density centrifugation to remove debris, cell suspensions were stained with Abs specific for mouse CD3 and TCRγδ, then analyzed by FACS. GFP+ cells were first identified (left) then analyzed with respect to CD3 and TCRγδ surface staining (right) where the percentage of GFP+ cells that are γδ T cells is shown (upper right quadrant). C, TRAMP-C2 tumors (top) were removed at necropsy from mice that had received GFP+ γδ T cells i.v. 8 days before. After disaggregation and centrifugation, cell suspensions were stained with Abs allowing for the identification of γδ T cells (left). These cells were then analyzed for the expression of GFP (right) where the percentage of tumor-infiltrating γδ T cells of donor origin (GFP+) is shown. Peripheral blood (bottom) taken from the same animal at necropsy was similarly analyzed for the percentage of peripheral blood γδ T cells of donor origin (GFP+). As shown in the FACS analysis strategy used in both the blood and the tumor cell preparations, acquired data were first plotted as TCRγδ PE-positive events by side scatter (left). This analysis was performed to allow the identical electronic amorphous gate to be used to identify γδ T cells in both tumor tissues (top) and blood (bottom), thus assuring consistency in subsequent comparative analysis of γδ T cells. When represented as forward scatter by side scatter plots, blood cell preparations demonstrated the characteristic forward scatter by side scatter profile of ACK-lysed blood (data not shown). In addition, the proportion of γδ T cells of donor origin (GFP+) was determined in both tumor tissue and blood obtained simultaneously from treated tumor-bearing mice. In this representative study (Fig. 5⇑C), over 70% of γδ T cells within tumor tissue were found to be of donor origin (GFP+), compared with only 17% in peripheral blood. 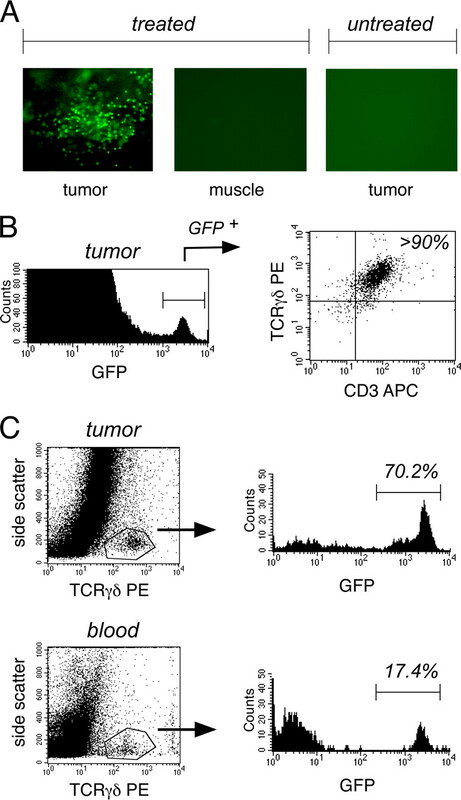 These data suggest that the GFP+ γδ T cells detected within tumor tissues are not simply contaminating peripheral blood-derived cells, but rather that these GFP+ cells are adoptively transferred γδ T cells, which have localized to tumor tissues. Although these studies (Fig. 5⇑) establish neither the mechanisms involved in homing nor the mechanisms by which adoptively transferred γδ T cells actually moderate tumor growth, these findings nevertheless demonstrate that adoptively transferred γδ T cells can infiltrate established tumors and that this infiltration may be important for these cells to subsequently exert their therapeutic antitumor effects in vivo. The immunotherapeutic potential of γδ T cells was additionally demonstrated using a model of metastatic disease. In this experiment, the ability of adoptively transferred γδ T cells to moderate the growth or progression of widespread disease was assessed by first introducing TRAMP-C2 cells i.v. into healthy male C57BL/6 mice, as has been previously described (30). Mice were then treated i.v. with syngeneic γδ T cells. Upon sacrifice, both by gross appearance (Fig. 6⇓A) and by assessment of lung weight (Fig. 6⇓B), treated mice were found to have lower tumor burdens compared with control, untreated mice. Histological analysis of formalin-fixed lung sections (Fig. 6⇓C) as well as morphometric analysis of these sections (Fig. 6⇓D) confirm that lungs removed from untreated mice were more heavily infiltrated with tumor cells compared with treated mice. Finally, although these particular studies were not designed as survival studies, Kaplan-Meier analysis of pooled cohorts of treated and untreated mice reveals that mice receiving γδ T cells displayed superior survival compared with untreated controls (Fig. 6⇓E). Mice treated with adoptively transferred syngeneic γδ T cells develop less extensive disseminated pulmonary disease and also appear to display superior survival compared with untreated animals. Widespread systemic disease was first established in healthy male C57BL/6 mice by the i.v. injection of 6 × 105 TRAMP-C2 cells on experimental day 0. Mice were then randomly assigned to a treatment group or a control group. On days 4, 8, and 11, treated mice received γδ T cells by tail vein injection, whereas control mice received medium alone. Mice were monitored for systemic signs of progressive disease and were all sacrificed on day 66. At necropsy, lungs from each animal were removed en bloc, weighed, and fixed in formalin for subsequent analysis. A, Representative photographic images comparing gross lung size and visible tumor nodules of formalin-fixed lungs removed from treated mice (left) and untreated mice (right). Scale size is shown in centimeters. B, For this experiment, the weight of freshly resected lungs was used as a quantitative measure of tumor burden. In this representative cohort, four mice in the untreated group died before the termination of the study and could not be included for pathologic or histologic analysis. Median lung weight (in milligrams) and range are shown for treated mice (n = 13) and untreated mice (n = 11). p = 0.0005 using the Kruskal-Wallis test. C, Formalin-fixed lungs were sectioned sagittally (superior to inferior) then embedded in paraffin for routine H&E staining. Representative low-power photomicrographic images of lung sections from treated mice (left) and untreated mice (right) are shown. D, Fixed and stained lung sections were analyzed using ImageJ morphometric software. Tumor involvement of lung sections was determined by expressing the area of lung parenchyma involved with tumor (dark blue) as a percentage of total lung parenchyma. Median tumor involvement (percentage) and range are shown for treated mice (n = 13) and untreated mice (n = 11). p = 0.0004 using the Kruskal-Wallis test. E, Comparison of survival of treated and untreated animals used in the experimental model of metastatic disease. Life tables (left) and Kaplan-Meier survival curves (right) of the pooled cohorts of mice collectively comparing treated mice (n = 26) to untreated control mice (n = 29). Data are censored at day 66. p = 0.002 according to the Mantel-Haenszel log-rank test comparing treated to untreated mice. The studies undertaken in this report were performed with two distinct yet logically related objectives in mind. Our first objective was to directly test the hypothesis that γδ T cells play a role in limiting the development or progression of spontaneously arising mouse prostate cancer (proof-of-concept studies) (Figs. 1⇑ and 2⇑). Our second objective was to test a specific prediction of this hypothesis, a prediction that asserts that if γδ T cells do indeed provide protective immunosurveillance against mouse prostate cancer, then introducing supraphysiological numbers of syngeneic γδ T cells into tumor-bearing mice would result in measurable control of established disease (adoptive immunotherapy studies) (Figs. 3–6⇑⇑⇑⇑). By breeding TRAMP mice with mice lacking γδ T cells, the opportunity is afforded to observe the development or progression of prostate cancer as it occurs in the specific absence of γδ T cells. Although potentially an important approach to directly assess whether γδ T cells play a role in limiting tumor development or progression, we nonetheless remained mindful of some of the limitations of this study or any study designed to assess immune responses directed against tumors arising in transgenic animals. First, in a general sense, it should be noted that even in fully immunocompetent TRAMP mice, disease development and progression can vary substantially between individual animals (10, 11, 12, 13). Second, in a more specific sense, it should be noted that in the TRAMP model, spontaneously arising tumors that develop in male TRAMP mice are known to express simian virus SV40 oncoproteins, which in this model are authentic tumor Ags that in theory could elicit strong protective adaptive antitumor responses by Ag-specific αβ T cells (10, 11, 12, 13). Importantly, however, it is now recognized that strong tolerance to SV40 Ags commonly develops in otherwise immunocompetent TRAMP mice. This development appears to occur through a variety of mechanisms, including possibly the clonal deletion of SV40-specific αβ T cells (31, 32). Accordingly, we believe that it is the fortuitous absence of a strong, protective adaptive SV40-specific immune response that ultimately permits us to detect the subtly enhanced tumor development occurring in some TRAMP × TCRδ−/− mice, as evidenced by our ability to observe a strong statistical trend (p = 0.06) for larger tumor burdens in TRAMP × TCRδ−/− mice (Fig. 1⇑B) as well as the strong statistical trend (p = 0.057) for greater numbers of TRAMP × TCRδ−/− mice developing high-grade disease as compared with immunocompetent TRAMP mice (Fig. 2⇑A). The observation that large, high-grade tumors develop in only some but not all TRAMP × TCRδ−/− mice strongly suggests that γδ T cells are providing protective immunosurveillance in a partially redundant, or possibly cooperative manner with other discrete elements of the innate or adaptive immune response. We surmise that γδ T cells may be cooperating with NK cells or with αβ T cells, including possibly SV40-specific αβ T cells that have remained functional. In the final analysis though, protective antitumor immunosurveillance that γδ T cells might provide in TRAMP mice is not absolute, given that eventually 100% of male TRAMP mice develop prostate cancer (10, 11, 12, 13). For this reason, as well as the limitations discussed, we feel that our proof-of-concept studies though important, ultimately serve best as logical support for the subsequent adoptive immunotherapy research presented in the balance of this study. Although current standard treatments for prostate cancer are usually effective at achieving initial disease control, prostate cancer often recurs. Moreover, salvage therapy for recurrent disease, or therapy for prostate cancer presenting initially as widespread metastatic disease, is often only modestly effective. Clearly, entirely new forms of therapy for recurrent or metastatic prostate cancer are needed. Although cell-based immunotherapies have been developed in this regard, the vast majority of studies have relied upon the generation of tumor Ag-specific adaptive immune responses (33, 34, 35, 36). These approaches, however, have been largely unsuccessful owing primarily to 1) the difficulties encountered in identifying tumor Ags that are truly prostate cancer-specific, and 2) the well-documented ability of prostate cancer cells to specifically evade adaptive immune responses through a variety of mechanisms, including the down-regulation of MHC class I molecules (33, 37, 38, 39). The ability of innately functioning γδ T cells to provide an alternative or complementary means to recognize and kill tumor cells, particularly those that have escaped Ag-specific, MHC-restricted adaptive immune responses, makes the development of γδ T cell-based cellular therapies particularly attractive in this regard (5, 40). By injecting otherwise healthy mice with a predetermined number of tumorigenic TRAMP-C2 prostate cancer cells, we have developed a model to quantitatively determine the extent to which the i.v. introduction of syngeneic γδ T cells can subsequently moderate the growth of disease (Figs. 4⇑ and 6⇑). The use of TRAMP-C2 cells in this model is important for several reasons. First, by specifically using the syngeneic TRAMP-C2 prostate cancer cell line to establish disease in otherwise healthy wild-type C57BL/6 mice, this process has allowed us by extension to approximate a clinical situation whereby a patient with prostate cancer is treated with a supraphysiological number of autologous γδ T cells. With this particular point in mind, it is important to note that in all studies, disease-bearing animals that received ex vivo expanded syngeneic γδ T cells tolerated repeated injections very well without any observed untoward side effects. Second, unlike primary tumors cells that develop in TRAMP mice, TRAMP-C2 cells do not express SV40 oncoproteins either in vitro, or subsequently in vivo upon transfer into otherwise healthy mice (18). Consequently, we believe that the confounding effects of adaptive immune responses directed against TRAMP-C2-derived tumors are potentially minimized, which is supported in part by our finding that in vitro, TRAMP-C2 cells are readily killed by γδ T cells but not by control αβ T cells (Fig. 3⇑B). As shown in Fig. 4⇑, i.v. administered syngeneic γδ T cells are capable of moderating the growth of palpable, established s.c. TRAMP-C2-derived tumors. That antitumor efficacy is so clearly evident against grossly palpable disease would strongly suggest that adoptively transferred γδ T cells would also be effective against minimal residual disease, such as microscopic disease that might persist after surgical resection or radiation therapy. Related to this point is the observation that adoptively transferred syngeneic γδ T cells are also effective against nonbulky but nevertheless, widespread disseminated disease (Fig. 6⇑). Thus, we would argue that the adjuvant delivery of γδ T cells would be a logical strategy to develop as a means to prevent local treatment failure or to prevent the development of widespread metastatic disease, particularly if given at a time when metastatic disease is only microscopically present. Biologically, it is likely that s.c. implanted tumors derived using TRAMP-C2 cells may not necessarily be comparable to tumors that develop spontaneously in TRAMP mice. Indeed, we originally wished to examine the ability of adoptively transferred γδ T cells to prevent the development of spontaneous disease in TRAMP mice. However, this approach was rejected on account that in TRAMP mice, both the latency period for disease development and the natural history of disease progression once disease develops can be quite variable from mouse to mouse (10, 11, 12, 13), thus making the interpretation of any immunotherapy studies extremely difficult. In contrast, by using the s.c. disease model, we were able to establish predetermined tumor burdens in otherwise healthy mice and then initiate therapy after a predetermined interval, allowing for more accurate measure of the immunotherapeutic effects of adoptively transferred γδ T cells against tumor cells (Fig. 4⇑). Although choosing to use the s.c. model represents somewhat of a compromise, importantly the robust immunotherapy data generated using the metastatic disease model (Fig. 6⇑) strongly corroborate the findings generated using the s.c. disease model. Interestingly in some respects, the metastatic model can be thought of as mimicking the advanced stages of disease found in TRAMP mice in which the development of widespread metastatic disease is not uncommon. Ultimately, we take these findings (Figs. 4⇑ and 6⇑) to support the view that adoptively transferred γδ T cells can mediate potent antitumor activity against mouse prostate cancer cells, irrespective of where or how disease might be established. Despite the strong theoretical promise and growing interest in γδ T cell-based immunotherapies, it still remains to be determined how best to exploit γδ T cells for the treatment of prostate cancer or any human malignant disease. Two distinct approaches are currently being developed in this regard (6, 19, 20, 21, 22, 23, 27, 41). One approach is based upon the in vivo activation or expansion of endogenous γδ T cells present within patients through the clinical administration of pharmacologic agents capable of stimulating γδ T cells. The second approach is based upon the adoptive transfer of γδ T cells first expanded ex vivo, then infused into tumor-bearing patients, as approximated in our current studies undertaken using the TRAMP mouse model. Clearly, although both approaches are rational and will likely lead to important advances in cancer treatment, from a conjectural point of view, we believe that the latter approach has several advantages that merit discussion. First, in adopting the latter approach it becomes possible to prospectively identify and consequently, selectively administer, specific γδ T cell subsets deemed more likely to be clinically effective against tumor cells. For example, using state-of-the-art cell separation technologies, γδ T cell subsets within ex vivo expanded cultures could be selectively enriched on the basis of specific phenotypic features found, or postulated, to be associated with more potent antitumor activity. Specific γδ T cell subsets could in theory be selected on the basis of defined criteria, including activation profile (determined by surface markers such as CD45 and CD27), unique patterns of cytokine production, expression of specific homing receptors, and other criteria. Studies in mice specifically addressing this point are ongoing in our laboratory. Second, in adopting the latter approach it becomes possible to experimentally track γδ T cells after administration, an important correlative tool for use in future clinical trials. Thus, in a manner analogous to our animal studies using GFP-marked γδ T cells for tracking (Fig. 5⇑), in human clinical trials it will be possible to first radiolabel ex vivo expanded γδ T cells with isotopes such as 111In or 99mTc, then track these γδ T cells to sites of disease using various clinical imaging techniques. Third, the latter approach makes possible the ex vivo expansion of γδ T cells derived from healthy donors and not just patients. Though beyond the scope of this discussion, the introduction of tumor-reactive allogeneic (donor-derived) γδ T cells might become feasible in the setting of newer, nonmyeloablative allogeneic hematopoietic stem cell transplants (42) in which donor-derived γδ T cells could be delivered as a posttransplant donor lymphocyte infusion as is commonly done after immunological tolerance is established. This option may become especially important given our observation (manuscripts in preparation) and the observation of others (43) that numeric and functional deficits appear to exist within the γδ T cell compartment of patients newly diagnosed with even the earliest-stage malignancies. In conclusion, it is important to acknowledge that our adoptive immunotherapy results presented in this study were not designed to establish the mechanisms involved in the homing of adoptively transferred γδ T cells to sites of disease. Indeed, as these studies were performed using unfractionated, ex vivo expanded spleen-derived γδ T cells, they do not address the possibility that distinct subsets of γδ T cells might be relatively more (or less) efficient at homing to specific tissues where disease is established. In addition, these studies were not designed to directly establish the mechanisms by which adoptively transferred γδ T cells recognize and kill tumor cells in vivo, though it is unlikely that in this model, adoptively transferred γδ T cells are recognizing and killing tumor cells through mechanisms other than those already known (1, 2, 3, 4, 5, 6, 7). 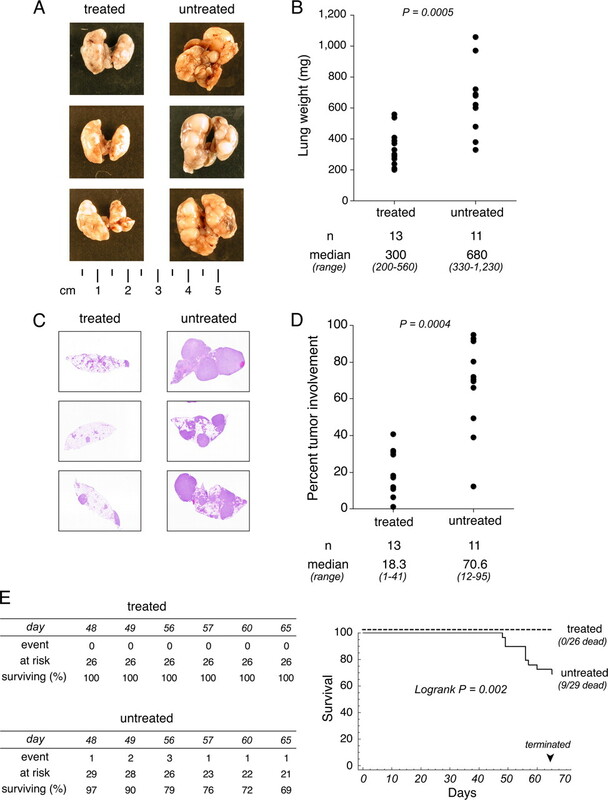 Nevertheless, despite these shortcomings, these studies are important demonstrations that the adoptive transfer of unfractionated, ex vivo expanded syngeneic γδ T cells is an effective and well-tolerated form of treatment for murine prostate cancer. Accordingly, these findings provide a strong biological rationale for the design of the corresponding studies in human disease, particularly now that the means exist to generate the larger numbers of γδ T cells required for such studies (23, 27). We thank Dr. Larry Lamb for thoughtful review of this manuscript. ↵1 This work is supported in part by a Congressionally Directed Medical Research Programs Award DAMD17-03-1-0265 from the U.S. Department of Defense. ↵3 Abbreviation used in this paper: GU, genitourinary. Groh, V., A. Steinle, S. Bauer, T. Spies. 1998. Recognition of stress-induced MHC molecules by intestinal epithelial γδ T cells. Science 279: 1737-1740. Groh, V., R. Rhinehart, H. Secrist, S. Bauer, K. H. Grabstein, T. Spies. 1999. Broad tumor-associated expression and recognition by tumor-derived γδ T cells of MICA and MICB. Proc. Natl. Acad. Sci. USA 96: 6879-6884. Cerwenka, A., A. B. Bakker, T. McClanahan, J. Wagner, J. Wu, J. H. Phillips, L. L. Lanier. 2000. Retinoic acid early inducible genes define a ligand family for the activating NKG2D receptor in mice. Immunity 12: 721-727. Girardi, M., A. C. Hayday. 2005. Immunosurveillance by γδ T cells: focus on the murine system. Chem. Immunol. Allergy 86: 136-150. Girardi, M.. 2006. Immunosurveillance and immunoregulation by γδ T cells. J. Invest. Dermatol. 126: 25-31. Kabelitz, D., D. Wesch, W. He. 2007. Perspectives of γδ T cells in tumor immunology. Cancer Res. 67: 5-8. Girardi, M., D. E. Oppenheim, C. R. Steele, J. M. Lewis, E. Glusac, R. Filler, P. Hobby, B. Sutton, R. E. Tigelaar, A. C. Hayday. 2001. Regulation of cutaneous malignancy by γδ T cells. Science 294: 605-609. Girardi, M., E. Glusac, R. B. Filler, S. J. Roberts, I. Propperova, J. Lewis, R. E. Tigelaar, A. C. Hayday. 2003. The distinct contributions of murine T cell receptor (TCR)γδ+ and TCRαβ+ T cells to different stages of chemically induced skin cancer. J. Exp. Med. 198: 747-755. Gao, Y., W. Yang, M. Pan, E. Scully, M. Girardi, L. H. Augenlicht, J. Craft, Z. Yin. 2003. γδ T cells provide an early source of interferon γ in tumor immunity. J. Exp. Med. 198: 433-442. Greenberg, N., F. DeMayo, M. Finegold, D. Medina, W. Tilley, J. Aspinall, G. Cunha, A. Donjacour, R. Matusik, J. Rosen. 1995. Prostate cancer in a transgenic mouse. Proc. Natl. Acad. Sci. USA 92: 3439-3443. Gingrich, J. R., R. J. Barrios, R. A. Morton, B. F. Boyce, F. J. DeMayo, M. J. Finegold, R. Angelopoulou, J. M. Rosen, N. M. Greenberg. 1996. Metastatic prostate cancer in a transgenic mouse. Cancer Res. 56: 4096-4102. Gingrich, J. R., N. M. Greenberg. 1996. A transgenic mouse prostate cancer model. Toxicologic Pathol. 24: 502-504. Gingrich, J. R., R. J. Barrios, M. W. Kattan, H. S. Nahm, M. J. Finegold, N. M. Greenberg. 1997. Androgen-independent prostate cancer progression in the TRAMP model. Cancer Res. 57: 4687-4691. Gupta, S., N. Ahmad, S. R. Marengo, G. T. MacLennan, N. M. Greenberg, H. Mukhtar. 2000. Chemoprevention of prostate carcinogenesis by α-difluoromethylornithine in TRAMP mice. Cancer Res. 60: 5125-5133. Hurwitz, A. A., B. A. Foster, E. D. Kwon, T. Truong, E. M. Choi, N. M. Greenberg, M. B. Burg, J. P. Allison. 2000. Combination immunotherapy of primary prostate cancer in a transgenic mouse model using CTLA-4 blockade. Cancer Res. 60: 2444-2448. Mentor-Marcel, R., C. A. Lamartiniere, I. E. Eltoum, N. M. Greenberg, A. Elgavish. 2001. Genistein in the diet reduces the incidence of poorly differentiated prostatic adenocarcinoma in transgenic mice (TRAMP). Cancer Res. 61: 6777-6782. Huss, W. J., R. J. Barrios, N. M. Greenberg. 2003. SU5416 selectively impairs angiogenesis to induce prostate cancer-specific apoptosis. Mol. Cancer Ther. 2: 611-616. Foster, B., J. Gingrich, E. Kwon, C. Madias, N. Greenberg. 1997. Characterization of prostatic epithelial cell lines derived from transgenic adenocarcinoma of the mouse prostate (TRAMP) model. Cancer Res. 57: 3325-3330. Bonneville, M., E. Scotet. 2006. Human Vγ9Vδ2 T cells: promising new leads for immunotherapy of infections and tumors. Curr. Opin. Immunol. 18: 539-546. Wilhelm, M., V. Kunzmann, S. Eckstein, P. Reimer, F. Weissinger, T. Ruediger, H. P. Tony. 2003. γδ T cells for immune therapy of patients with lymphoid malignancies. Blood 102: 200-206. Dieli, F., N. Gebbia, F. Poccia, N. Caccamo, C. Montesano, F. Fulfaro, C. Arcara, M. R. Valerio, S. Meraviglia, C. Di Sano, et al 2003. Induction of γδ T-lymphocyte effector functions by bisphosphonate zoledronic acid in cancer patients in vivo. Blood 102: 2310-2311. Dieli, F., D. Vermijlen, F. Fulfaro, N. Caccamo, S. Meraviglia, G. Cicero, A. Roberts, S. Buccheri, M. D’Asaro, N. Gebbia, et al 2007. Targeting human γδ T cells with zoledronate and interleukin-2 for immunotherapy of hormone-refractory prostate cancer. Cancer Res. 67: 7450-7457. Lopez, R. D., S. Xu, B. Guo, R. S. Negrin, E. K. Waller. 2000. CD2-mediated IL-12-dependent signals render human γδ T cells resistant to mitogen-induced apoptosis, permitting the large-scale ex vivo expansion of functionally distinct lymphocytes: implications for the development of adoptive immunotherapy strategies. Blood 96: 3827-3837. Liu, Z., B. L. Guo, B. C. Gehrs, L. Nan, R. D. Lopez. 2005. Ex vivo expanded human Vγ9/Vδ2 γ/δ T-cells mediate innate antitumor activity against human prostate cancer cells in vitro. J. Urol. 173: 1552-1556. Guo, B. L., Z. Liu, W. A. Aldrich, R. D. Lopez. 2005. Innate anti-breast cancer immunity of apoptosis-resistant human γδ-T cells. Breast Cancer Res. Treat. 93: 169-175. Salot, S., C. Laplace, S. Saiagh, S. Bercegeay, I. Tenaud, A. Cassidanius, F. Romagne, B. Dreno, J. Tiollier. 2007. Large scale expansion of γ9δ2 T lymphocytes: Innacell γδ trade mark cell therapy product. J. Immunol. Methods 326: 63-75. Drobyski, W. R., D. Majewski. 1997. Donor γδ T lymphocytes promote allogeneic engraftment across the major histocompatibility barrier in mice. Blood 89: 1100-1109. Britten, C. D., S. G. Hilsenbeck, S. G. Eckhardt, J. Marty, G. Mangold, J. R. MacDonald, E. K. Rowinsky, D. D. Von Hoff, S. Weitman. 1999. Enhanced antitumor activity of 6-hydroxymethylacylfulvene in combination with irinotecan and 5-fluorouracil in the HT29 human colon tumor xenograft model. Cancer Res. 59: 1049-1053. Zhang, Q., X. Yang, M. Pins, B. Javonovic, T. Kuzel, S. J. Kim, L. V. Parijs, N. M. Greenberg, V. Liu, Y. Guo, C. Lee. 2005. Adoptive transfer of tumor-reactive transforming growth factor-β-insensitive CD8+ T cells: eradication of autologous mouse prostate cancer. Cancer Res. 65: 1761-1769. Zheng, X., J. X. Gao, H. Zhang, T. L. Geiger, Y. Liu, P. Zheng. 2002. Clonal deletion of simian virus 40 large T antigen-specific T cells in the transgenic adenocarcinoma of mouse prostate mice: an important role for clonal deletion in shaping the repertoire of T cells specific for antigens overexpressed in solid tumors. J. Immunol. 169: 4761-4769. Krejci, K. G., M. A. Markiewicz, E. D. Kwon. 2004. Immunotherapy for urological malignancies. J. Urol. 171: 870-876. Rini, B. I., E. J. Small. 2001. Immunotherapy for prostate cancer. Curr. Oncol. Rep. 3: 418-423. Tjoa, B. A., G. P. Murphy. 2000. Progress in active specific immunotherapy of prostate cancer. Semin. Surg. Oncol. 18: 80-87. Peshwa, M. V., J. D. Shi, C. Ruegg, R. Laus, W. C. van Schooten. 1998. Induction of prostate tumor-specific CD8+ cytotoxic T-lymphocytes in vitro using antigen-presenting cells pulsed with prostatic acid phosphatase peptide. Prostate 36: 129-138. Blades, R. A., P. J. Keating, L. J. McWilliam, N. J. George, P. L. Stern. 1995. Loss of HLA class I expression in prostate cancer: implications for immunotherapy. Urology 46: 681-687. Bander, N. H., D. Yao, H. Liu, Y. T. Chen, M. Steiner, W. Zuccaro, P. Moy. 1997. MHC class I and II expression in prostate carcinoma and modulation by interferon-α and -γ. Prostate 33: 233-239. Sanda, M. G., N. P. Restifo, J. C. Walsh, Y. Kawakami, W. G. Nelson, D. M. Pardoll, J. W. Simons. 1995. Molecular characterization of defective antigen processing in human prostate cancer. J. Natl. Cancer Inst. 87: 280-285. Hayday, A. C.. 2000. γδ Cells: a right time and a right place for a conserved third way of protection. Annu. Rev. Immunol. 18: 975-1026. Lopez, R.. 2002. Human γδ-T cells in the adoptive immunotherapy of malignant and infectious diseases. Immunol. Res. 26: 207-221. Deeg, H. J., M. B. Maris, B. L. Scott, E. H. Warren. 2006. Optimization of allogeneic transplant conditioning: not the time for dogma. Leukemia 20: 1701-1705. Argentati, K., F. Re, S. Serresi, M. G. Tucci, B. Bartozzi, G. Bernardini, M. Provinciali. 2003. Reduced number and impaired function of circulating γδ T cells in patients with cutaneous primary melanoma. J. Invest. Dermatol. 120: 829-834.